Buckner Hightower of Excalibur Almaz spoke at the Frontiers of Flight Museum on Saturday. His talk revealed some interesting details of Excalibur Almaz’s plans and current status. Hightower said that Excalibur Almaz has completed all of its scheduled milestones under its unfunded Space Act Agreement with NASA’s Commercial Crew and Cargo Development program. As part of this work, the EADS Astrium consortium developed a service-module concept for the four Russian TKS capsules which Excalibur Almaz has purchased. Hightower said that Excalibur Almaz is prepared to step in and replace one of the primary CCDEV partners, if unexpected difficulties arise, but EA’s primary focus is no longer on the International Space Station or Low Earth Orbit. 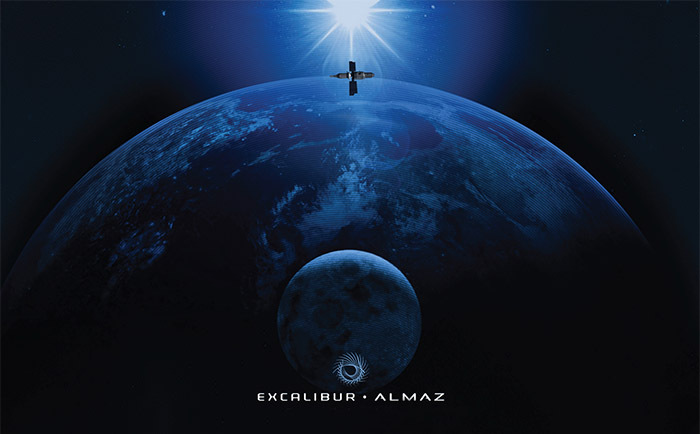 Excalibur Almaz is now focusing on cislunar flights. The company wants to place one of its two Salyut-class Almaz space stations in a halo orbit around the Earth-Moon L2 point, on the far side of the Moon. L2 would be the farthest human beings have ever ventured from the surface of the Earth. The Almaz space station was originally designed as a military reconnaissance station, which could photograph the Earth and return photos with small ejectable reentry capsules. As a result, the Almaz space station has a 2-meter telescope which could be used to study the Moon and the ability to eject small landers to the lunar surface. The station is designed for a crew of six, but Excalibur Almaz would reconfigure it for a crew of five. This configuration would allow for a three-week mission at L2. Excalibur Almaz believes a mission to L2 could generate $900 million in revenues. That includes three seats which would be sold to sovereign government or private space explorers for $150 million apiece, delivery of satellites to L2 for $75 million apiece, delivery of small payloads to the lunar surface for $350 million apiece, and $32 million for naming rights. Hightower believes Excalibur Almaz could perform its first L2 mission in about 30 months, after recapitalization. It’s likely to take longer than that, in our view. Like SpaceX’s Red Dragon concept, this is a bold and exciting concept but may be a step too far at the present time. In our view, mankind needs to achieve a solid foothold in space by establishing reliable, routine, low-cost access before deep-space missions like this will still to pay off. That’s why we are focusing on suborbital missions. On the other hand, there’s no reason why both approaches can’t be pursued in parallel. Whether Excalibur Almaz succeeds or fails, it won’t harm the quest to develop low-cost reusable space vehicles and might help. That is in marked contrast to the vision of space exploration advanced by the Lunar and Planetary Institute’s Dr. Paul Spudis, who continues to bash commercial spaceflight at every opportunity. Dr. Spudis was a member of the Aldridge Commission, which produced space-policy recommendations in support of the Bush Vision of Space Exploration. The Aldridge Commission’s final report proclaimed that human spaceflight would “remain the providence [sic] of government” for the foreseeable future. Incredibly, that report came out just a few week after Mike Melvill earned the first FAA Commercial Astronaut wings flying SpaceShip One. They say that hindsight is always 20/20 – except when it comes to government commissions, apparently. Dr. Spudis continues to exhibit the same short-sightedness today. Suborbital spacecraft may play an important role in training astronauts for orbital and deep-space missions. Today, US astronauts (and their foreign counterparts) receive no training on rocket-powered vehicles prior to their first orbital flight. Whether they are pilots or payload operators, they are “thrown into the deep end of the pool” on their first space mission. Space agencies attempt to compensate, through extensive ground-based training and simulation, but the step up from ground-based training to actual flight is still enormous. Then, completing their mission, astronauts face a gap of many months or years before their next flight. Military and airline pilots have to meet regular “currency requirements,” but astronauts have no way to stay current in rocket-powered vehicles. NASA has recognized the potential value of suborbital spacecraft for astronaut training. In 2008, NASA Administrator Mike Griffin said, “We could use commercial suborbital human transportation for early training and qualification of astronauts. If I could buy a seat to suborbital flight for a few hundred thousand dollars, why wouldn’t we have all of our new astros make their first flight in such a manner?” NASA never followed through on proposed studies of such training, however, perhaps because of budget overruns in other areas. Commercial space companies are interested, however. XCOR Aerospace and Excalibur Almaz recently signed a memorandum of understanding that would open the door for XCOR to provide training for Excalibur Almaz astronauts using the Lynx spacecraft. If the idea catches on, suborbital spaceflight may become a standard part of the training toolkit for all future astronauts. Such training could provide additional impetus for the development of a commercial spaceports near national space centers. It could be a particular boon to Texas. There has already been talk of establishing a suborbital spaceport at Ellington Airport, adjacent to NASA’s Johnson Space Center. Commercial suborbital spacecraft would be a useful supplement to the fleet of T-38 Talon jet trainers which NASA already has based at Ellington. 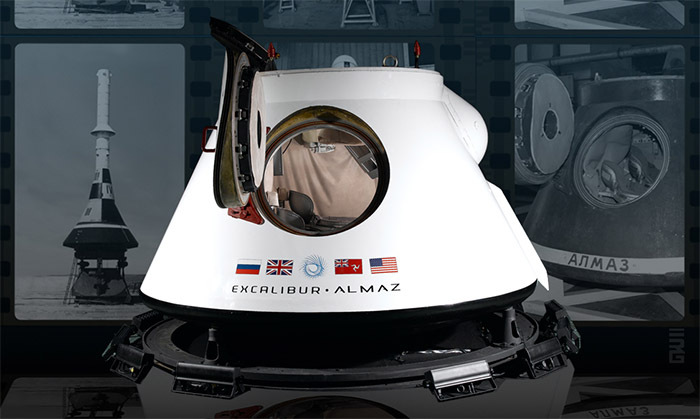 Excalibur Almaz is marketing a commercial space capsule called the RRV, or Reusable Reentry Vehicle, based on the TKS capsule developed by the Soviet Union during the Cold War. The TKS capsule was intended for use with the Almaz (military Salyut) space station. It was tested in an unmanned configuration, but the Almaz program was cancelled before manned flights of the capsule were conducted. You are currently browsing the archives for the Excalibur Almaz category.